One ill turn deserves another, we hears. 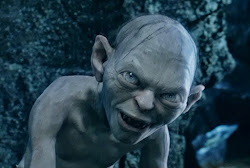 Since Baggins stole our precious, we thinks that we should steal from him. So we takes his song! But we doesn't like it much, no, not very much at all. We makes it much, much better. Look! Look, followers! When next we brings food there. And gets it back for MEEEE! As at our loss we screams. On paths that we will show. For now they are done for! Very funny! Your blog really should have more followers! I Tweeted about it, so hopefully more people will find your blog.